This story cultivated utter rage inside of me because of the stupidity that was perpetuated in this criminal case. 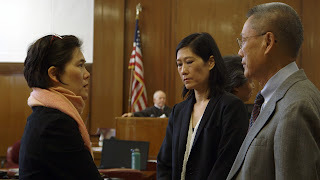 The story follows Abacus, a smaller bank centered in the Chinatown community in New York City, and its massive trial where it was almost dissolved. The bank was accused of making phony loans to borrowers while all of the big boy banks paid fees and saw no criminal indictments. I myself, being Chinese, was infuriated by the sick process of prosecution that the District Attorney in New York County embarked on. This was a monumental film as it tackled an anomalous situation in the worst economic period in our country since The Great Depression. It fantastically captured the injustices committed on the Chinese individuals implicated by this trial. Segments of the film such as when the many employees were paraded in a chain of handcuffs down the law enforcement buildings were sickening to watch. The idea of racism being heavily prominent in our “post-racial” or modern society was increasingly prevalent with each scene going by. While I have studied and witnessed prejudice against black Americans, I had not seen a display of prejudice against Asians in the current time. The frightening notion that humongous bank organizations such as J.P. Morgan and Bank of America had destroyed the economy with minor repercussions percolated in my mind. Knowing that Abacus was a small bank with loans that were mostly resolved adequately stimulated my substantial questioning of the justice system. The thoughts of the family who owned Abacus were permeating the screen as we could see them in emotional distress. Just thinking, as the film allowed us to, about how one could face so many charges and not know about their future freedom made me cringe. The documentation of how much evidence the family presented which supported their innocence by bounds was executed excellently. What Abacus was trying to do from its inception was to help the Chinese immigrants get needed financial services. The message imbued by this film of how the bank was helping out the residents was stellar. Some scenes of the family being together reminded me personally of my own family reunions at the dim sum restaurant. How they shared their Chinese dishes allowed the audience to see their bonds in a pure form. I have absolute respect for this film and truly admire the incredible story-telling done by its creators. This needs to be seen by everyone!